Since the early 1980s, the production of flux-cored wires (FCWs) in Japan has been increasing year by year, reaching over 125,000 metric tons in 2007 [Ref. 1]. This figure accounts for about 35% of the total annual production of all welding consumables in Japan. FCWs are mainly used by shipbuilders; 60% of all welding consumables used in Japanese shipyards are FCWs [Ref. 2]. The high consumption of FCWs in shipyards can be attributed to their superior characteristics: a high deposition rate and excellent usability (low spatter, self-peeling slag removal, and less undercut) in positional semiautomatic, mechanized, and robotic welding of thin and thick wall work. With a higher deposition rate, welding speeds can be increased and thus welding efficiency can be improved; additionally, the consumption of shielding gas can be reduced due to shorter welding times. Figure 1 compares the deposition rates of FCWs (rutile and metal types), solid wires, and covered electrodes. 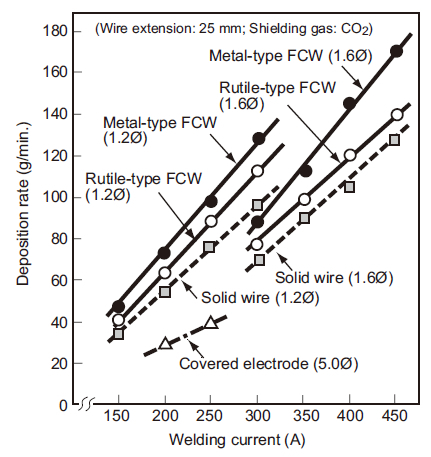 Figure 1: Deposition rates of covered electrodes, solid wires,rutile-type FCWs, and metal-type FCWs as a function of weldingcurrents. As shown in the figure, the deposition rate of FCWs is approximately 10% higher than that of solid wires and is far higher than that of covered electrodes. The deposition rate of metal-type FCWs is also about 15% higher than that of rutiletype FCWs. It should be noted, though, that deposition rate increases as welding current increases for any welding consumable. The effect of welding current on deposition rates is vital, particularly for FCWs, because they can use higher welding currents in all-position welding as compared with sold wires and covered electrodes. Most FCWs are designed to use high currents in the globular transfer mode. The globular arc with an FCW generates very low spatter and less undercut with a stable arc due to the effect of the cored flux. The viscous molten slag of all-position-type FCWs keeps the weld pool in suitable shape to produce excellent bead appearance in positional welding. Therefore, as shown in Figure 2, high welding currents can be used in any welding position, thereby facilitating high deposition rates and thus high welding efficiency as such. 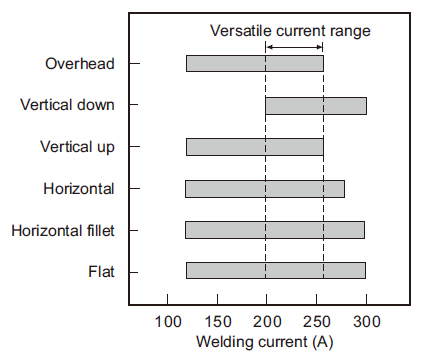 Figure 2: Proper welding current ranges for individual welding positions and versatile current range for positional welding (DW-100, 1.2Ø, CO2 shielding). Such superior characteristics of FCWs have met the requirements of shipbuilders for improving welding efficiency by employing semiautomatic, mechanized, and robotic welding processes to compete in the highly competitive shipbuilding industry. This is why the consumption of FCWs has been increased in shipbuilding. Welding Technology, April 2008. Sanpo Publications Inc.
 Takeuchi, Suga. Robot Welding of Large Structures. Seizando Co.